Automatisierung, Demografie und Ungleichheit sind bekanntlich Kernthemen von bto. Demografie und fehlende Produktivitätsfortschritte sind Kern der Eiszeit-These, verbunden mit der Überschuldung. Automatisierung kann eine Chance sein, die Eiszeit zu überwinden und ist für mich in der Tat gerade für Gesellschaften wie unsere mehr Chance als Risiko. Ich weiß aber, dass dies gerne auch anders gesehen wird. Grund genug, eine Studie der Unternehmensberatung BAIN hier zu diskutieren. BAIN & COMPANY gehört zu den Top 3 weltweit und ist gerade in jüngster Zeit auch in Deutschland sehr erfolgreich. „Demographics, automation and inequality have the potential to dramatically reshape our world in the 2020s and beyond. Our analysis shows that the collision of these forces could trigger economic disruption far greater than we have experienced over the past 60 years.“ – bto: Verbinden wir das noch mit der Schuldenkrise, wird es lustig. „The majority of the world’s workforce is aging rapidly. We forecast US labor force growth, for instance, will slow to 0.4 % per year in the 2020s. 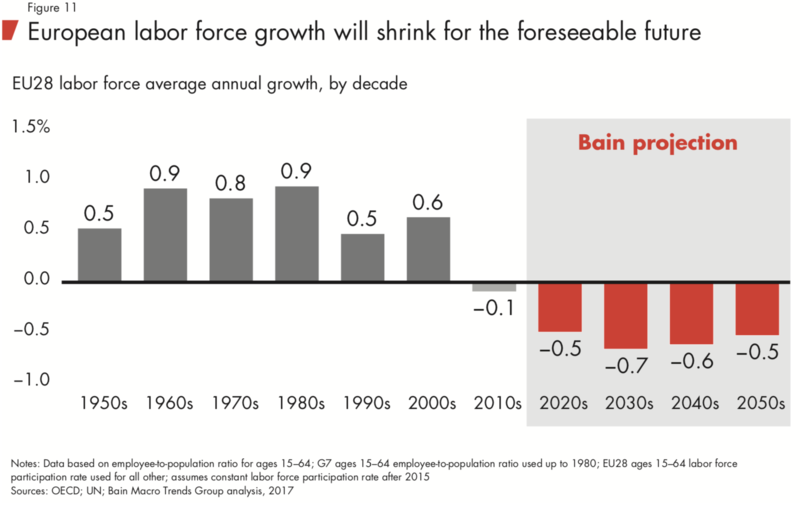 That major demographic shift is bringing an end to the abundance of labor that has fueled economic growth since the 1970s. 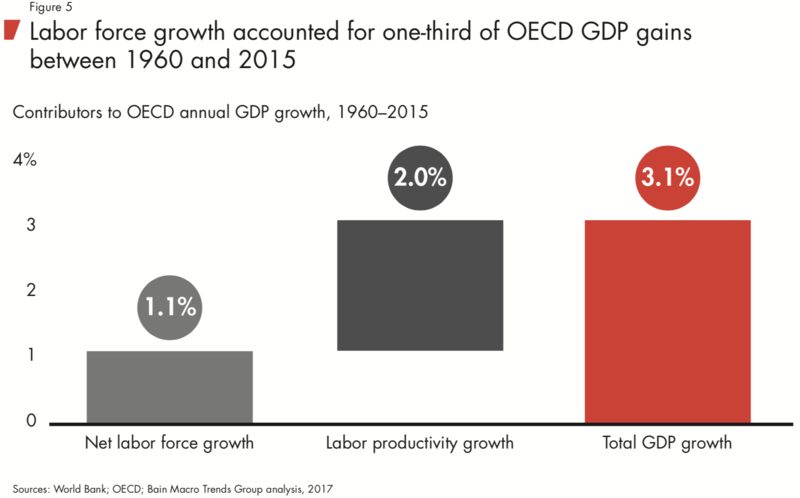 (…) As the total size of the labor force stagnates or declines in many markets, the momentum for economic growth should slow.“ – bto: Das ist inzwischen allgemein bekannt. „(…) governments will face major challenges, including surging healthcare costs, old-age pensions and high debt levels. On the plus side, the lagging wages of mid- to lower-skilled workers in advanced economies should benefit from the simple economics of greater demand and lesser supply.“ – bto: Hätte ich auch gedacht. Bisher tritt der Effekt aber nicht ein, auch in Japan nicht. Ich denke, dies hat mit dem weltweit weiter steigenden Arbeitskräfteangebot zu tun. 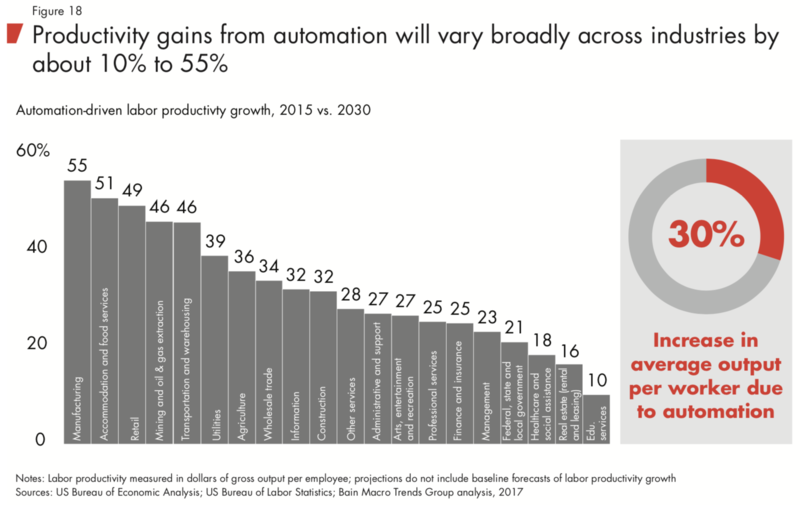 „Faced with a rising scarcity of labor, companies and investors are likely to draw increasingly on automation technologies (…) Our analysis shows automation is likely to push output potential far ahead of demand potential. 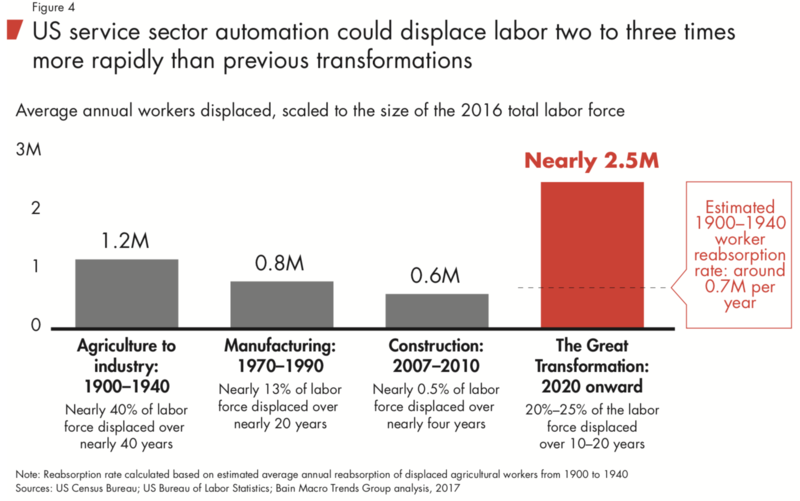 The rapid spread of automation may eliminate as many as 20% to 25% of current jobs — equivalent to 40 million displaced workers — and depress wage growth for many more workers.“ – bto: Die Zahlen beziehen sich auf die USA. Sie sagen also, das Angebot wächst viel stärker als die Nachfrage. Das bedeutet Deflation, was die Schulden endgültig untragbar macht – und wir bekommen ein neues Prekariat. 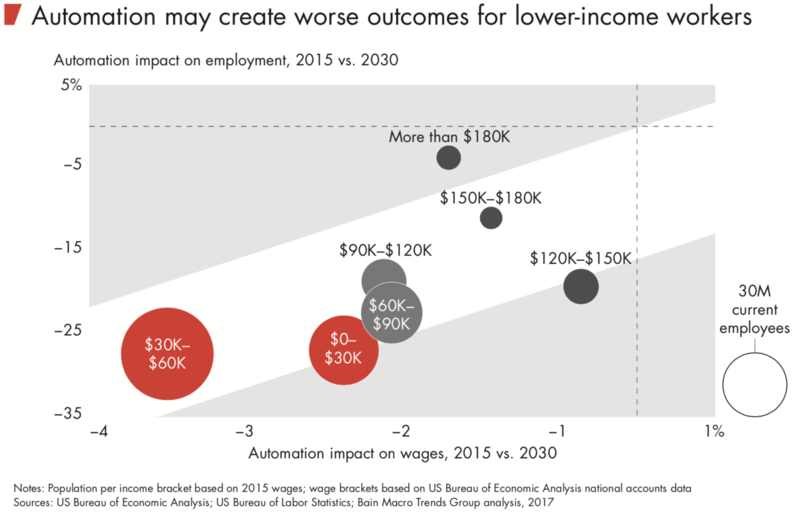 „The benefits of automation will likely flow to about 20 % of workers — primarily highly compensated, highly skilled workers — as well as to the owners of capital. The growing scarcity of highly skilled workers may push their incomes even higher relative to lesser-skilled workers. As a result, automation has the potential to significantly increase income inequality and, by extension, wealth inequality.“ – bto: Das kann so sein. Man könnte auch sagen, dass es zu mehr Regulierung und Besteuerung kommt. „(…) a (…) rapid rollout over 10 to 20 years would trigger a massive investment surge, up to an incremental $8 trillion in the US alone, based on our estimates. Much of the added output potential would be directed back toward meeting investment demand, pushing overall growth rates back up to levels seen in the 1980s and 1990s.“ – bto: Da hätte ich gerne gesehen, wie sie das berechnet haben. 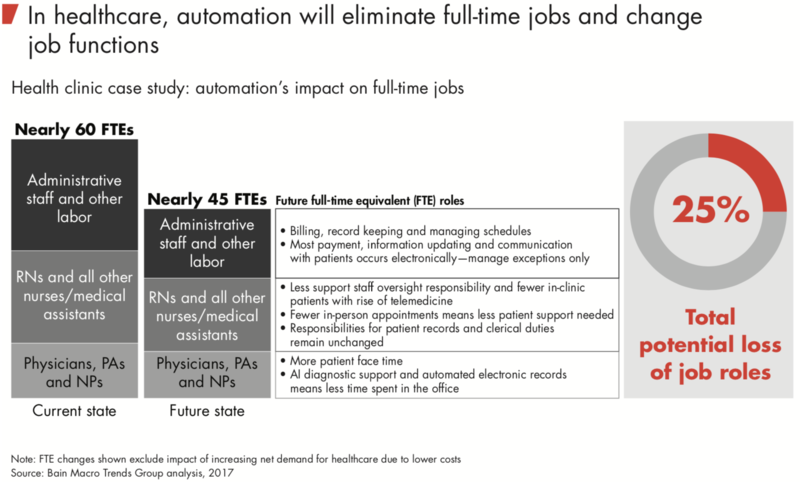 „(…) rapid automation of the US service sector, for example, could eliminate jobs two to three times more rapidly than in previous transformations (see Figure 4). As the investment wave recedes, it may leave in its wake deeply unbalanced economies in which income is concentrated among those most likely to save and invest, not consume. 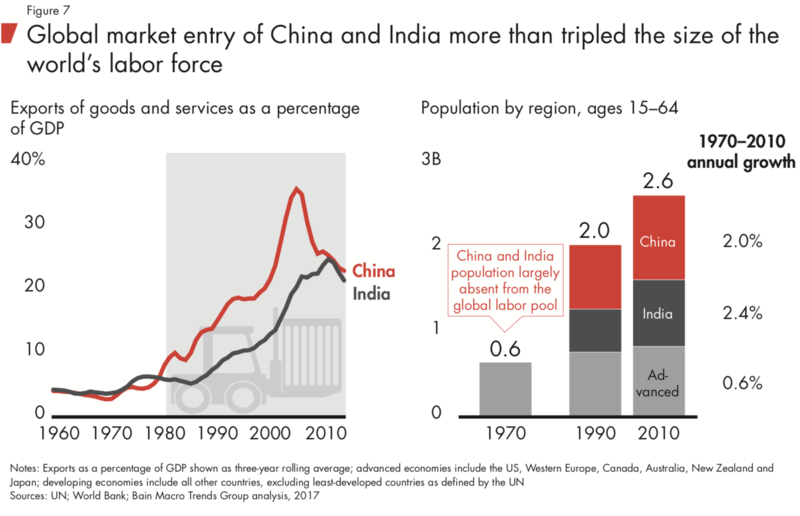 Growth at that point would become deeply demand constrained, exposing the full magnitude of labor market disruption temporarily hidden from view by the investment boom. Hier kommt nun die Produktivität ins Spiel. Zunächst zeigt BAIN, was wir wissen. Nämlich, dass die Produktivitätszuwächse seit Jahren rückläufig sind, was auch damit zu tun hat, dass weniger investiert wird. Dies soll sich durch die bevorstehende Automatisierungswelle ändern: „We estimate that by 2030 these technologies could increase labor productivity by an average of 30% compared with 2015, with rising impact over time. This step-change improvement varies considerably by industry and ranges from relatively modest levels in healthcare and educational services to substantial impact in industries such as food service, retail, transportation and warehousing.“ – bto: Das ist einleuchtend und deckt sich mit den Vermutungen anderer Beobachter. 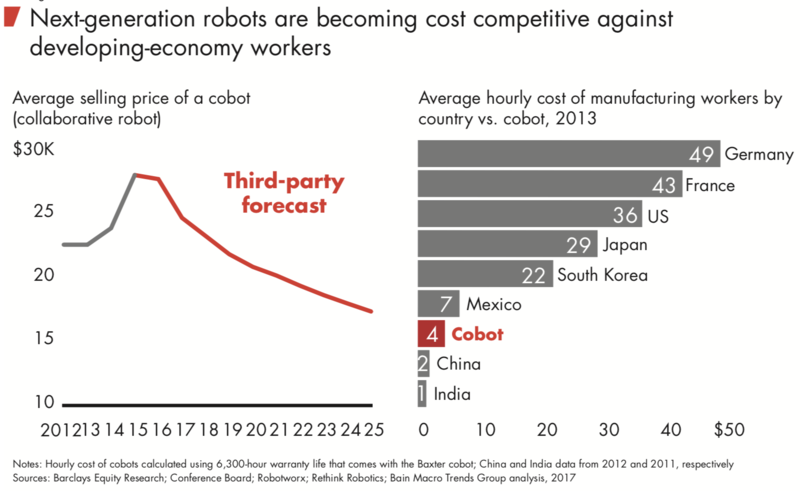 „Cobots, which sit alongside humans to enhance labor productivity in manufacturing, are an example of how companies are closing the cost gap. These helper robots cost less than one-quarter the price of traditional robots, and by 2013, they were already cheaper than human workers in every advanced economy and most developing economies. By enhancing the productivity of their human counterparts, automation will likely make manufacturing costs attractive closer to home shores.“ – bto: Das kann man unter Umweltgesichtspunkten begrüßen, reduziert es doch den Transport um die Welt. Wenn man sich das Chart ansieht, erkennt man, vor welchem gewaltigen Druck gerade auch Deutschland steht – ein Albtraumszenario angesichts der Bildung der Zuwanderung. „Our analysis concludes that the coming phase of automation could eventually eliminate up to 50 % of all current jobs. The job activity analysis only suggests the potential of technology to replace humans with hardware and software.“ – bto: wohl dem Land, das den Rückgang der Bevölkerung akzeptiert und nicht auf Migration setzt! „The full impact of automation likely won’t play out until after 2030 because cheap labor will continue to be available in some sectors and some businesses will be slower to adopt automation. 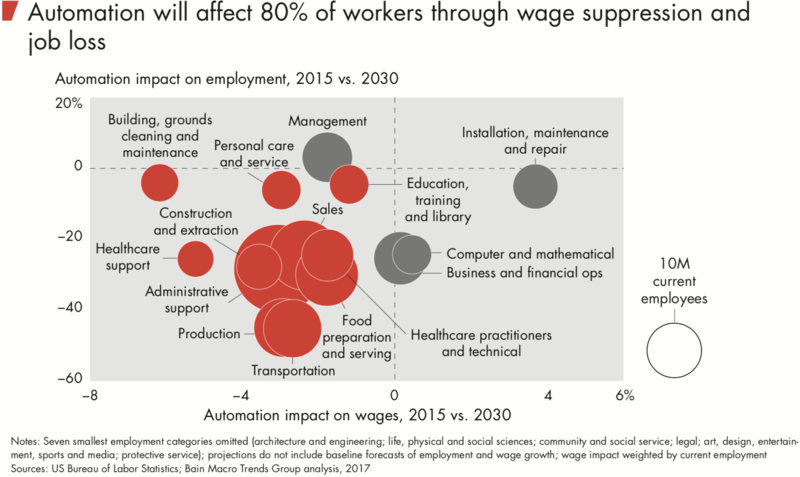 However, in some sectors, automation may put downward pressure on wages long before workers are displaced. For example, the introduction of self-service kiosks and smartphone-based ordering technology in quick-service restaurants is likely to place a ceiling on order-taking wages at the point which it becomes cheaper to automate than employ a human order taker.“ – bto: Es geht frontal gegen jene Jobs, die die Zuwanderer ausüben könnten. Und für jene, die meinen, in Krankenhäusern und in der Pflege wäre kein Wandel zu erwarten, dem sei diese Beispielrechnung eine Warnung. Was dann zum Blick auf alle Branchen führt: weniger Arbeitsplätze und geringere Löhne, wohin man blickt. Ich halte es für plausibel. Denn im Unterschied zu den früheren Revolutionen geht es diesmal vor allem um Bildung. Deshalb ist es ein so großes Problem, dass wir weltweit ein Bevölkerungswachstum haben, das nicht mit der Bildung einhergeht. Siehe PISA-Ergebnisse in Afrika und dem Nahen Osten. Damit produzieren wir Arbeitslose ohne Perspektive. Danach beschäftigt sich BAIN ausführlich mit der Ungleichheit und der vermuteten Einkommensentwicklung der einzelnen Alterskohorten, um dann zur entscheidenden, ebenfalls nicht überraschenden Erkenntnis zu kommen: Es trifft die Armen. Das wiederum würde ich als zusätzlich problematisch ansehen, weil wir es schon heute mit einem hohen Anteil an Migranten bei den Armen zu tun haben. Unsere kräftige Zuwanderung von niedrig Qualifizierten schafft uns in Kombination mit dem massiven technologischen Wandel ein erhebliches soziales und wirtschaftliches Problem. „Over the past four decades, economies around the world have increasingly struggled with weak demand growth. An economy firing on all cylinders should grow faster, but a persistent lack of demand growth has restrained overall growth. Intermittent bouts of debt-fueled investment and consumption have temporarily boosted demand only to be followed by a crash and a time of readjustment. The best example of this was the global financial crisis and the Great Recession, the impacts of which are only now subsiding in many countries.“ – bto: So ist es. Wir haben mit Schulden die Illusion von Wohlstand geweckt. 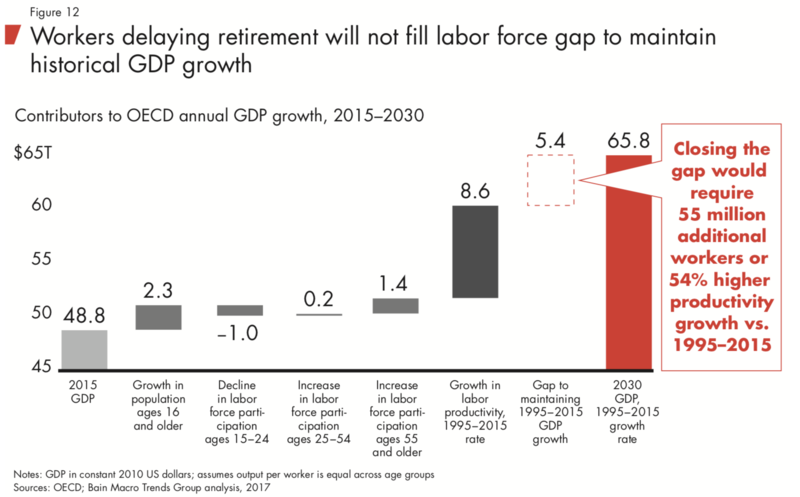 „Societal aging is bringing an end to plentiful labor growth, but older populations will continue to fuel steady demand. In isolation, this trend should create the potential for relatively balanced demand growth vs. supply growth and a generally more sustainable, if lackluster, economy. However, the rapid spread of automation and worsening income inequality push in the opposite direction. Automation, in particular, has the potential to significantly increase supply growth, but the job losses and wage pressures it triggers should act to restrain demand growth likely from the middle of the 2020s on.“ – bto: also ein massiv deflationäres Szenario, das alle Schulden untragbar macht. 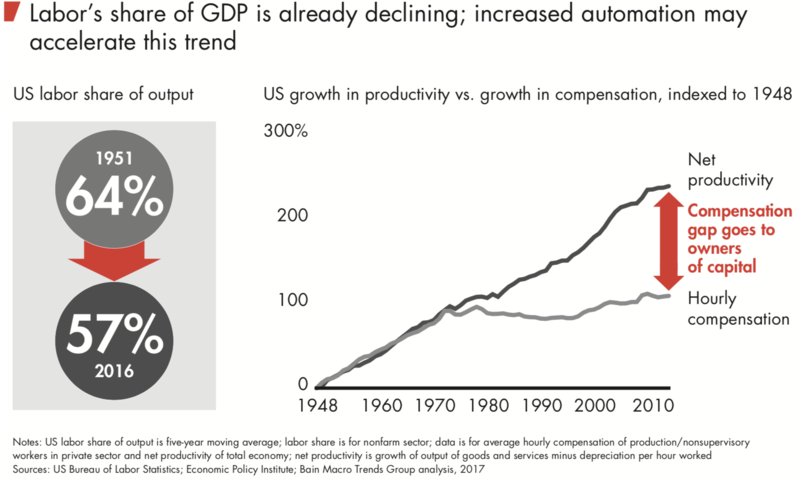 „The magnitude of automation we anticipate would require a significant surge of capital investment, (…) comparison might be to (…) the Roaring Twenties when robust investment in the automotive, radio and petrochemicals industries, along with associated infrastructure spending on roads, electrical grids, telephone lines and the consequent urbanization, created a period of increased labor productivity and increased economic growth. In this type of investment boom, supply growth creates the demand for more supply — a virtuous cycle of growth. However, as investment saturation sets in, financial capital ebbs, and new machinery and equipment is left with-out sufficient demand.“ – bto: Das ist sicherlich eine sehr interessante Überlegung. Bain kommt damit zu einem gemischten Ergebnis: Viele Industrien werden revolutioniert, das Produktivitätswachstum nimmt deutlich zu, aber die Nachfrage wird fehlen, weil ein großer Teil der Bevölkerung Arbeit verliert und die alternde Gesellschaft ohnehin weniger konsumiert. Die Ungleichheit wird steigen und damit der Druck auf Regierungen, mehr umzuverteilen und mehr zu regulieren. Die Studie unterstreicht die fatale Logik einer Zuwanderung von gering qualifizierten Menschen, da diese dauerhaft von Transfers leben werden. Es wird deutlich, dass es besser ist, voll auf den Trend der Automatisierung zu setzen, weil er ohnehin kommt. Also Roboter statt Zuwanderer. Es wird zu einem deflationären Schock in der Welt führen und ist damit nicht die Lösung für die Schuldenprobleme der Welt, sondern ein weiteres Problem. BAIN geht von steigenden Zinsen wegen des gestiegenen Kapitalbedarfs für die Investitionen aus. Das kann sein. Es kann aber auch sein, dass die Notenbanken die Zinsen tief halten, weil sie denken, sie könnten die Anpassung so erleichtern. Auf jeden Fall erhöht es die Turbulenzen in der Weltwirtschaft und es ist durchaus realistisch, wenn BAIN „Jahrzehnte der Disruption erwartet„. Ich bin skeptisch. Nicht, dass die o.g. Entwicklungen nicht in Teilen eintreten werden, davon bin ich auch überzeugt. Sondern was das Gesamtbild betrifft. Was wurden nicht schon vor Jahrzehnten für Vorhersagen zum Produktivitätswachstum gemacht, angefangen vom papierlosen Büro bis zum vollautomatisierten Restaurant! Seltsamerweise sind im Dienstleistungssektor bis heute diese Produktivitätsgewinne weltweit nur in Bruchteilen realisiert worden. Alle Welt fragt sich, warum der IT-Einzug nicht seit Jahrzehnten deutlicher volkswirtschaftlich messbar ist. Klare Antworten sind bis heute für mich nicht erkennbar. Das nächste ist der Fachkräftemangel (und hier meine ich echte Fachkräfte). Wir haben ja schon Schwierigkeiten in diesem Land, bei Neubauten einen normalen Telekomanschluss pünktlich und funktionsfähig hinzubekommen. Wer soll denn die High-Tech-Automaten entwickeln und bedienen? Vor allem, wenn nach Abschaltung der AKWs und der Kohlekraftwerke das Stromnetz mit Spannungsschwankungen so anfällig wird, dass schon die vorhandenen empfindlichen Gerätschaften regelmäßig ausfallen werden. Daher glaube ich, dass parallel zu der o.g Entwicklung eine weitere Entwicklung mit einer Verschlechterung der Produktivität einen gegenläufigen Effekt hervorrufen wird. Nämlich die des schrittweisen technologischen Abstiegs mangels personeller Möglichkeiten. Ein Beispiel: Mag sein, dass der Taxifahrer in 10 Jahren ein aussterbender Beruf ist, weil für die Entwicklung des autonomen KFZ weltweit genügend Manpower, Kapital und gesetzliche Änderungen eingesetzt wird. Wenn man aber gleichzeitig im Westen nicht mehr in der Lage ist, noch einen qualifizierten Stahlbetonbauer / Planer / Prüfingenieur für Tausende maroder Straßenbrücken zu finden, wirft einen das produktivitätstechnisch wieder zurück, denn dann muss das autonome Fahrzeug weite Umwege fahren oder im Stau stehen. Ich bin erst dann wieder optimistisch, wenn überdimensionierte Studiengänge wie „Kulturwirt“, „Theaterwissenschaften“, „Vergleichende Literaturwissenschaft“, „Marketing“ und ähnliches einen massiven Rückgang der Studienanfängerzahlen erleben und zeitgleich echte Mangelberufe eine neue Blüte erleben. Ob das jetzt der OP-Pfleger in der Klinik ist oder die Wartungstechnikerin für eine Klimaanlage. Davon merke ich zumindest in Deutschland noch nichts. Nach Gesprächen mit Freunden in den USA, UK, Polen und Italien sieht es dort wohl nicht viel besser aus; zu anderen Ländern wie Japan fehlen mir die Informationen. Und daher wird m.E. der technologische Fortschritt den ansonsten stattfindenden gesellschaftlichen Rückschritt nur bremsen oder kompensieren, aber nicht zu großen Sprüngen nach vorne führen. ich stimme Ihnen vollkommen zu. Und nenne Ihnen aus Erfahrung im Bereich des Bauhandwerkes 2 Gründe, warum ihre Einschätzung in diesem Bereich uns vor große Probleme stellen wird. Einen haben Sie in der fehlenden Qualifizierung schon selbst genannt. Da ist zum Einen die unterirdische Bezahlung (oder die zu hohe Abgabenlast, das dürfen Sie sich aussuchen) eines ausgelernten Handwerksgesellen im heimischen Betrieb im Vergleich zu Verdiensten in der Industrie (siehe in unserer Region das Abwandern von ausgelernten Gesellen in den Industriepark Höchst oder an den Frankfurter Flughafen). Bei einem Tariflohn von 14,95€ im Westen für einen Maurer bleiben einem unverheirateten jungen Mann bei 160 Stunden Arbeitszeit im Monat in der Lohnsteuerklasse 1 ca. 1550 € netto übrig. Dieses Geld verdient er in Industriebetrieben häufig sehr viel einfacher und salopp gesagt, mit einem Dach über dem Kopf. Zum Anderen haben insbesondere deutsche Familien irgendwann beschlossen, das es Ihren Kindern „BESSER“ gehen soll und somit natürlich so ein profane Bauausbildung keine Erwerbsbiographie für Ihre Sprößlinge darstellt. Somit lernen im Baugewerbe viele nicht Deutschstämmige ein Handwerk. Dies ist keineswegs falsch zu verstehen, sondern zu begrüßen. Meine besten Lehrlinge sind zur Zeit ein Afghane, eine Eriträer, eine Kurde und ein Türke. Super Typen, fleißig und lernwillig. Es sagt aber generell viel über eine deutsche Gesellschaft aus, wenn man sich die Hände nicht mehr schmutzig machen möchte. Der Sprößling sollte doch das Abitur machen. Dies schafft er dann auch irgendwie aufgrund eines abgewirtschafteten Schulsystems und studiert dann???????? Ja was? Für die MINT Fächer langt es dann vorne und hinten nicht und es werden die von Ihnen genannten Studiengänge absolviert. Und dann kommt das, was wir heute schon haben und in Zukunft noch gravierender wird: Fachkräftemangel. Und das die Bezahlung im Baugewerbe besser wird, bleibt abzuwarten. Die Politik wird schon einen Weg finden, den Facharbeiter weiter zu melken. Es wird erst bedeutend besser in diesem Land, wenn es vorher bedeutend schlechter geworden ist. Dann besinnen wir uns evtl. wieder auf das, was wichtig in unserem Land ist. Denn wie heißt es so schön: Ohne Fleiß, kein Preis. Und Baustellen hat unsere Gesellschaft mehr als genug. Die sollte man aber auch anpacken! Aber das kommt mit dem Schmerz, der auf unsere Gesellschaft noch zukommt. Wann hat die enttäuschende Lohnentwicklung in den angesprochenen Bauberufen eingesetzt? Vor etwa 20 Jahren u.v.a. Punkten auch wegen der EU Osterweiterung und dem Boom Sub-Sub-Sub Unternehmer aus Osteuropa zu beauftragen? Nach dem Konkurrenzkampf mit Ostdeutschen (nicht ausgelateten) Handwerksbetrieben und deren niedrigerem Lohnniveau? Wie ist das Durchschnittsalter in diesen Berufsgruppen wenn die Nachwuchsfrage drückt? Wann schalten wir voraussichtlich diesen Sektor ab? Wer von seiner Arbeit nicht leben kann, in seiner Heimat muss ETWAS anderes machen – oder WO anders…? Herr Papst, es gibt noch einen weiteren Grund, warum der Facharbeiter zu wenig verdient: weil sein Chef sich einen zu hohen Gewinn genehmigt. Ich bekomme vom Handwerksbetrieb 45€ + MwSt für die Stunde in Rechnung gestellt, wovon der Monteur nur max. 40% bekommt. Ich hatte hier schon Handwerksmeister mit gerade mal 3 Angestellten, die der Meinung waren, daß sie selbst nicht mehr mitarbeiten müssen und daß es reicht, wenige Stunden im Büro zu sitzen. Wegen der billigen Konkurrenz kann der Meister dann leider, leider kein Weihnachtsgeld zahlen, aber für eine üppige Gewinnentnahme reicht es dann doch. Ich hoffe auf eine scharfe Rezession im Baugewerbe, damit es endlich die notwendigen, bereinigenden Insolvenzen gibt. Wahrscheinlich geht die Sucht nach Betongold aber noch eine ganze Zeitlang weiter. Dann lesen Sie mal Thomas Barnett, ein amerikanischer Geostratege. Das ist genau das, was in den USA vorgeplant wurde. Ich verstehe die Naivität der meisten Foristen nicht, die den geopolitischen Aspekt dessen, was „Globalisierung“ (und das nicht Freihandel!) ausmacht. Wenn Sie mit „Das“ meinen, was BAIN aufzeigt, ist es ganz sicher nicht etwas, das VORGEPLANT wurde in USA. WER soll denn das SO vorgeplant haben? Die USA sind URSÄCHLICH ganz wesentlich und ganz überwiegend an den einzelnen Entwicklungen beteiligt. Es sind aber längst nicht mehr NUR Entwicklungen, die von den USA KONTROLLIERT werden können. Stark beeinflusst ja – aber nicht kontrolliert. Seine Vorstellungen von Globalisierung, d. h. einer „Gleichschaltung aller Länder der Erde“ wird sich aller Voraussicht nach nicht erfüllen, insbesondere werden die Gegner eines solchen Projekts nicht mit einem „We shall kill them“ ruhigzustellen sein. Die USA werden immer dann aufhören mit ihrem „We kill“, wenn es zu teuer wird, vor allem wenn es zu viel Blut kostet. Das war seit dem Vietnamkriegt immer so. Es wird auch weiterhin so sein. Daran wird auch die zunehmende Technologisierung der Kriegsführung nichts ändern. …man kann dort Kosten senken, aber es gab noch nie wohlhabende Einkommen in diesen Sektoren. Rationalisiert wird seit der Industrie 3.0 in allen Sektoren was immer möglich ist. Bsp. : nur 2% der Menschen arbeiten noch in der Landwirtschaft und die Rationalisierung wird durch zu kleine Betriebsgrößen gebremst (alte Bundesländer). Kleiner Betrieb = zuwenig Umsatz. –> bei großen Umsätzen und hoher Auslastung rentiert hohe Automatisation (vgl. https://www.youtube.com/watch?v=UOuA2Qdc8bQ ), dann spielen aber Gemeinkosten eine erhebliche Kalkulationsrolle. In München lohnen Eigentumswohnungen und in Bratislava solche Fabriken, weil die Grundstückspreise neben der Gewerbesteuer punkten. Nichts rechtfertigt unseren Wohlstand, wenn die Ressource Mensch an Wert verliert. Die Automatisation rettet weder unser Sozialsystem,. noch unseren Wohlstand, weil die Deutschen global konkurrieren müssen und nicht auf einem einsamen Planeten leben. Weniger Beschäftigte in höheren Positionen gleichen den Verlust an Beiträgen nicht aus und die Massenakademisierung geht am Bedarf vorbei, weil die Innovation auf sich warten lässt. Zugleich verringern Asiaten den Abstand, weil deren Menschen mehr Biss und weniger Zicken haben als westeuropäische Waldorfkinder. Unser Wohlstand geht runter, weil schon viel Wertschöpfung gliobalisiert ist, rationalisiert ist er eh schon. Wenn jetzt die Auslastung unserer Premium-Preis-0%Leasing-Industrien flöten geht, teilen diese Werke das Problem der westdeutschen Bauern. UK Zulassungszahl im Septemer .-20.5%, ohne Abgaszirkus… (vgl. Querschüsse). Kostensenkung im fastfood Sektor ist keine Antwort auf die Probleme. Der überfällige Strukturwandel kommt zusammen mit dem Euroende…Strukturwandel meint Wohlstandsabbau um >50%..
b) Sie zeigt, dass aufgrund der sich beeinflussenden und z. T. entgegenlaufenden Trends prognostische Aussagen über die GESAMTENTWICKLUNG nicht möglich sind – noch nicht einmal für ein einziges Land wie Deutschland. @DT: Das mit der Orientierungslosigkeit und Unsicherheit dürfte mit großer Wahrscheinlichkeit eintreten, aber 100 % sicher ist das nicht. Sollten sich irgendwann doch noch die Leute durchsetzen, die eine andere Politik machen, halte ich es nicht für ausgeschlossen, dass es auch ohne Orientierungslosigkeit geht. Mit dem vorhandenen Personal, dem aktuellen Bildungsstand der Bevölkerung und der allgemeinen Einstellung zum Thema Migration und Bildung gehen wir aber in den westlichen Ländern ganz sicher den von Ihnen genannten Weg. Kann schon sein, würde es jedenfalls nicht ausschließen. Die eine Frage ist, wer sich mit was durchsetzt. Angenommen, dass eine „vernünftige Politik“ betrieben würde, können sich die Bevölkerung oder große Teile der Bevölkerung noch so lange erheblich vor den Kopf gestoßen fühlen, bis sie wieder festen Grund unter den Füßen haben. Ich kann einfach nicht erkennen, wie die Welt aussehen müsste, die durchweg allen Menschen eine so stabile Zukunftsperspektive bieten würde, wie nach WK II oder doch wenigstens einigermaßen eine solche, wenn man – durchaus berechtigt – annimmt, dass die Menschen in Zukunft mehr Ungewissheit akzeptieren. @DT: Eine „stabile Welt“ wie von Ihnen postuliert nach dem 2. Weltkrieg kann ich ehrlich gesagt weder politisch noch wirtschaftlich so erkennen, aber vielleicht bin ich da jetzt Schwarzseher. Koreakrieg, Indochina- und dann Vietnamkrieg mit Agent Orange, koloniale Befreiungskriege in Afrika und Asien, Schießbefehl an der innerdeutschen Grenze, Ungarnaufstand 1956, 17.06.1953 in der DDR, Prager Frühling, Terroristen (z.B. von der PLO), 2 Ölkrisen mit erhöhter Inflation in der Folge, Sonntagsfahrverbote, Invasion Afghanistans durch die Sowjets 1979, aufkommende Drogensucht in allen möglichen Staaten, Biafra, Bhopal, Bloody Sunday in Nordirland, ETA im Baskenland, oberirdische Atomtests, Maos großer Sprung nach vorne und Kulturrevolution, … ich weiß gar nicht, wo ich anfangen soll. Stabil war da höchstens das Reihenhaus in den 70ern in Frankfurt am Main als Angestellter der Dresdner Bank aus der 4. Reihe. Schon als deren Chef (Herr Jürgen Ponto + 1977 durch RAF) war gar nichts stabil. Und für die Gegner der Startbahn West auch nicht. Die Panzer stehen in der Garage (okay, auch weil die Ersatzteile fehlen…^^), die Arbeitslosigkeit war schon mal deutlich höher, die Inflation übrigens auch. Der Chef des „Spiegel“ sitzt nicht mehr einfach so drei Monate unrechtmäßig im Gefängnis, sondern wird nur durch den Rückgang der Abozahlen für schlechte Leistungen abgestraft. Ich halte es da mit Churchill, der meines Wissens mal gesagt hat: Demokratie ist, wenn es um 6.30 Uhr früh an der Tür klingelt und Du Dir sicher sein kannst, dass es nur der Milchmann ist. (gemeint war: …und nicht die Gestapo, die Stasi, der KGB oder wer auch immer von der Sorte). Ärmel hochkrempeln, , über den richtigen Weg streiten und nach dem rechten Weg suchen. Und den einzelnen Fliehenden in den Entwicklungsländern via TV, Internet und persönlicher Besuche von Seiten der westlichen Staaten ununterbrochen eine klare Ansage machen. Wenn Du kommen willst, hänge Dich vorher bildungstechnisch rein, dann hast Du eine Chance. Wenn nicht, dann nicht. Wenn Du über das Smartphone Internet hast, um Dich über Schlepper zu informieren, kannst Du Dich auch als Gegenleistung bilden. Oder, um in der katholischen Soziallehre zu bleiben: Schenk dem Bedürftigen keinen Fisch, sondern ein Netz und bring´ ihm fischen bei. Alles nicht neu. Sie haben vollkommen recht, wenn Sie darauf verweisen, dass von „stabiler Welt“ in den ersten Jahrzehnten nach WK II keine Rede sein kann. Selbst das stabile Westdeutschland hing sozusagen am seidenen Faden, wenn man bedenkt, was hätte passieren können, wenn während der Kubakrise ein sowjetischer Offizier seine Zustimmung dazu gegeben hätte, ein Atom-Torpedo auf ein amerikanisches Schiff abzuschießen. HEUTE ist vermutlich ein neu zu erwerbendes Reihenaus in F/M selbst für einen Angestellten in der 3. Reihe der Commerzbank oder DB eine risikoreichere Entscheidung (falls er überhaupt noch in der Lage ist, eine solche zu treffen). Ist auch meine Meinung, vor allem mit Blick auf das, was vielfach um uns herum geschieht. Wir leben so, als hätten wir ein Dauerabo für gute Zeiten. Und da wir es nicht haben, habe ich außerdem die Befürchtung, dass wir nicht sonderlich gut damit zurechtkommen, wenn wir realisieren, es nicht zu haben. Eine merkwürdige Studie. Sämtliche Aussagen und Schlussfolgerungen lassen sich auf eine einzige Annahme zurückführen: es wird einen massiven Produktivitätsschub geben, und zwar in Folge der Automatisierung. Da fragt man sich, was die Automatisierungswelle auslösen soll. Die einzigen Gründe, die ich in der Studie finden kann sind: die Unternehmen werden in die Automatisierung investieren, um Fachkräftemangel auszugleichen. Hmm, ausgleichen ok, aber die Studie spricht von Produktivitätszuwächsen, die weit über den blossen Ausgleich des Fachkräftemangels reichen. Noch merkwürdiger ist der Wasserfallchart, der den Produktivitätsanstieg als Gap definiert, der geschlossen werden muss, um Wachstumsraten der Vergangenheit zu erreichen. Wo steht es denn, dass das Wachstum immer gleich bleiben muss. Aus meiner Sicht arbeitet die Studie auf einer sehr dünnen analytischen Grundlage, um solch steile Thesen zu begründen. Ich frage mich, was das Ziel der Studie sein soll. Am Ende läuft es darauf hinaus, dass es für Arbeitnehmer – egal welcher Bildungsstand- nur nach unten gehen wird. Gewinner werden die Kapitalbesitzer sein. Also ran an Aktien, ETF, Investmentfonds uvm. @MSt: Das Ziel dieser Studie ist bei Consultants immer das gleiche: Aufmerksamkeit potentieller Auftraggeber, die sich in Aufträge verwandeln sollen. Und interne Klarheit und Einigkeit über das Zukunftsszenario, auf das man sich als große Consultunternehmung irgendwie verständigen muss, um geschlossen und konsistent aufzutreten. Gewinner werden neben den Kapitalbesitzern auch hochspezialisierte Arbeitnehmer sein; unqualifizierte ganz sicher aber nicht. >Alle Welt fragt sich, warum der IT-Einzug nicht seit Jahrzehnten deutlicher volkswirtschaftlich messbar ist. Klare Antworten sind bis heute für mich nicht erkennbar. Wenn man in Euro misst, sieht man vielleicht tatsächlich nicht viel. Aber vergleichen wir doch einmal Geschäftsberichte aus den 70ern-80ern mit den heutigen PowerPoint-Präsentation oder die Special Effects bei Star Wars 4 (also dem ersten) mit den heutigen Episoden… oder auch die heutigen geschwungenen Autokarosserien mit den eckigen von damals… oder den hochauflösenden 3D-Computerscans mit Röntgenbildern etc. pp. Ich schätze, dass sich die Informationstechnologie mehr in der Qualität der Produkte und Dienstleistungen und nicht so sehr in deren Quantität bemerkbar macht. Interessant ist das letzte Bild: Seit den 70er Jahren stagniert die Lohnentwicklung, obwohl die Produktivität weiter zunimmt. Er gibt dort auch eine Kombination von Gründen an, die diese Stagnation erklären könnte. Eine Diskussion dieser Gründe ergäbe einen spannenden eigenen bto-Artikel!